Adipex-P is one of the most popular weight loss pills, which first appeared in 1959. The main ingredient of this anorectic type of drug is Phentermine, and it comes in the form of a capsule or a tablet. 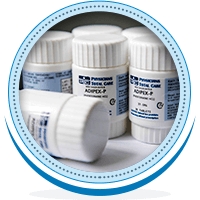 Adipex-P works by making the user feel full, even if they consume smaller amounts of food. Adipex-P suppresses appetite and increases energy levels, which makes exercising much easier for obese people. However, side effects of Adipex-P are similar to those of amphetamine (which may include fast, pounding, or irregular heartbeat, difficult, burning, or painful urination). How do you take Adipex-P? First and foremost, to meet the criteria for Adipex-P use, a person’s body mass index (BMI) should exceed 30 kg/m2. Adipex-P can cause problems with sleeping; that is why it is advised to take it only once a day one hour before, or two hours before breakfast. If needed, your doctor can adjust the dose, since it is very important to consume the least amount of the drug to avoid a possible overdose, which can be fatal. What are the dangers of Adipex-P? Dangers of Adipex-P include paranoia, hallucinations, tremors, panic attacks, depression, fatigue, hypertension, hypotension, arrhythmia, and circulatory problems. Adipex-P is a habit-forming drug, so do not increase your dose by yourself or take it longer than prescribed. Furthermore, a sudden halt of Adipex-P ingestion is not recommended, because it can trigger extremely unpleasant withdrawal symptoms. Using Adipex-P is not recommended in all cases. Pregnancy is one of the most prominent cases during which Adipex-P use is highly advised against. Needless to say, the drug can impede the normal development of the fetus. Continually, breastfeeding is also contraindicated with this medicine. And last but not least, combining Adipex-P with other diet pills is extremely dangerous and can cause pulmonary hypertension, which can be fatal. What are the side effects of Adipex-P? Adipex-P side effects may include irregular heart rate, mood changes and hallucinations, libido changes, uncontrolled muscle spasms, short breath, ankle swelling, chest pain, and allergic reactions to the drug’s inactive ingredients. In very rare cases, side effects of Adipex-P can include seizures, severe headaches and vision problems. Another not-so-unusual side effect of this drug is tolerance. Your body will eventually adapt to a prescribed dose of the medicine. If that happens, it is very important to stop using the drug to avoid addiction problems or potential overdose. What If Addiction Does Occur? If you notice that you have developed a dependence on Adipex-P and that you are taking higher doses of the drug, you should immediately contact your doctor and share your concerns. Upon receiving the information, the doctor will probably gradually lower the dosage so that you will not have to experience severe withdrawal symptoms such as depression and fatigue. While on Adipex-P, your nutrition should be based on 1200 calories a day, depending on your personal needs. Your doctor will likely recommend physical exercise at least 30 minutes a day, just to increase calorie deficit. Just like in almost every other calorie reduction diet you are allowed to eat all vegetables and fruits—although you have to be careful with sugar intake. Also, you can eat non-fat dairy and lean meats such as chicken, turkey breast, and fish. Cereals and rice are rich in fibers, and therefore very good for your diet while on Adipex-P. According to most users, this pill has proven to be quite effective. It helped them lose weight and create a habit of exercising and eating healthy. Because of that, they found that the weight loss continued even after they had stopped taking Adipex-P.
One thing that almost all users advise is that you have to remind yourself to eat constantly. Otherwise, you will feel lightheaded and cranky. The pill was not quite effective in cases when the person did not exercise. According to some reports, Adipex-P caused a complete loss of appetite, trouble with sleeping, nausea, vomiting, dry mouth, and even sleep paralysis. Some people say that cravings and binge eating kicked in after one stops using the drug. Other patients have reported that Adipex-P put strain on their marriages and relationships. Allegedly, reasons for that were severe mood changes, anger, agitation, pushing people away for no obvious reason, and other out-of-character behavior. Keeping in mind all the pros and cons when it comes to Adipex-P, one question remains—is it worth it? It is very difficult to distinguish the cause for some unusual side effects. Is it the drug itself, or not consuming enough food and water? One thing is for sure; Adipex-P, just like any other diet pill is not a magical solution to your weight problem. This medicine should be just an addition that helps you in your battle with obesity along with creating a healthy lifestyle and making smart food choices.